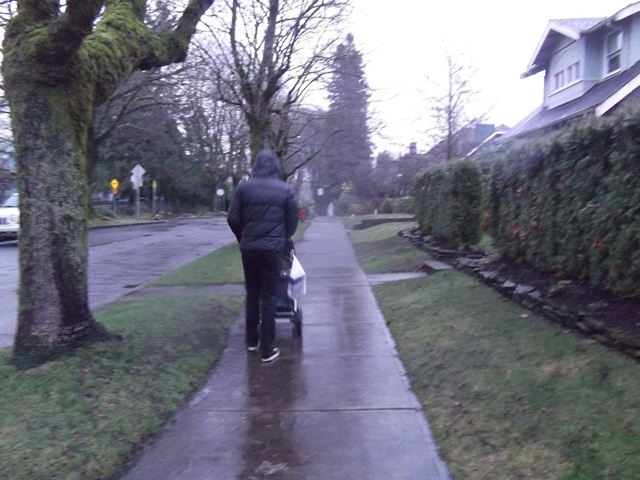 Vancouver is the sort of place you kind of want to run away from for about eight months of the year. When the clouds are low and the rain never really lets up, it’s awfully dark and everything is just so … moist. The smell of the city in this weather is distinctive, and in places where a lot of bodies are crammed together, the scent is reminiscent of a herd of damp sheep. It’s sort of weird then that the place I’ve been fantasizing about lately is London. Rainy London with its fish and chip shops and dark beers and the possibility that one might trip over Clive Owen and somehow get to keep him. If I’m going to have to bundle up for the rain, I’d rather do it someplace with good fried fish to eat when I come in from the cold. This recipe is based on one from the Billingsgate Market Cookbook, which is an excellent guide to British seafood and seafood cookery. 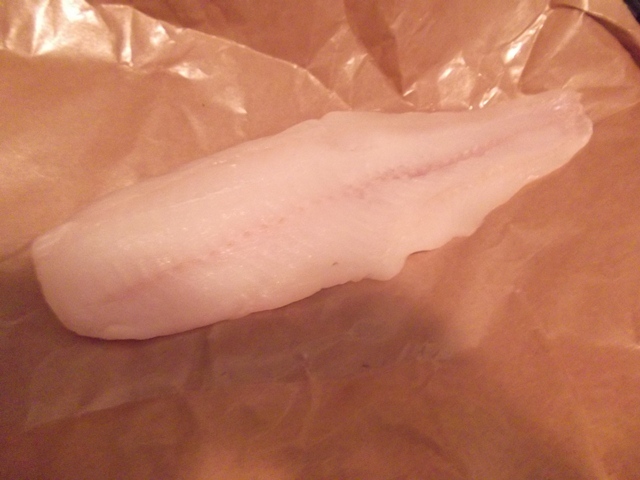 I used a local cod, but you can use whatever white fish you prefer. Sprinkle fish pieces with 1/4 cup of flour. Set aside. Cut potatoes into pieces about 1/2-inch thick, to the length you prefer. Shorter pieces means more fries, and I like more fries. Soak in cold water for five minutes, then remove to a wire rack lined with paper towels and pat thoroughly dry. 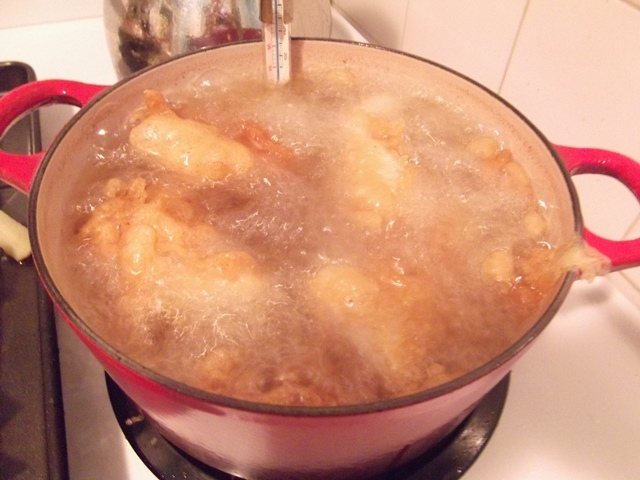 If you have a deep-fryer, heat your oil to 325°F. If you don’t, then pour oil to a depth of two inches into a heavy-bottomed pot such as a Dutch oven. Using a candy thermometer to monitor the heat, bring the oil to 325°F. Blanch potatoes in batches for 3 to 5 minutes each (unless you’re extremely daring/stupid like me, in which case blanch them all at once while wearing oven mitts and instructing whoever’s close by to stay near and hold a large box of baking soda for the scary grease fire that will surely break out when all that oil boils over into the burner). Place blanched potatoes back on wire rack. Pat dry with paper towel. You’ll spend a lot of time patting stuff dry. I might not have mentioned that. Combine flour, Old Bay or curry powder, baking powder, cayenne pepper (if using), and salt. Whisk in beer until a thin batter forms; add water to thin as needed. Increase the heat of the oil to 340°F. Using tongs, dip each piece of fish in batter to coat, then dredge for 10 seconds in the oil before releasing. If you just drop the fish into the pot, it’ll stick to the bottom. Fry for five to seven minutes, or until crispy and golden. Set fish on paper towel to drain, and sprinkle with sea salt. Heat oil to 350°F. Return potatoes to the pot in batches, cooking until golden (another five minutes or so). Remove from oil to paper towel, sprinkle with salt, and then serve. 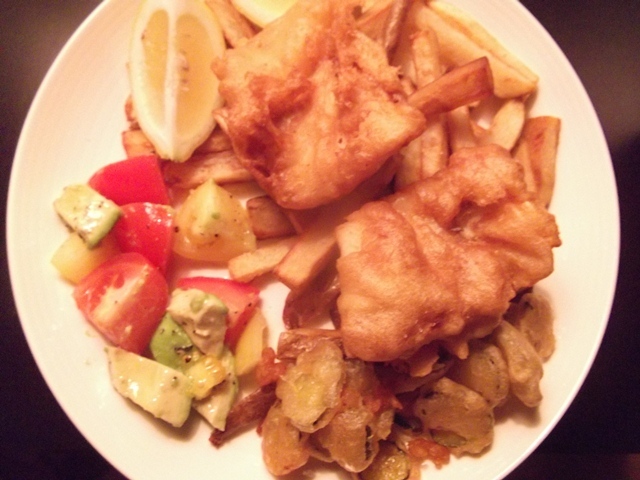 Serve fish and chips hot, with slices of lemon, malt vinegar, and tartar sauce. 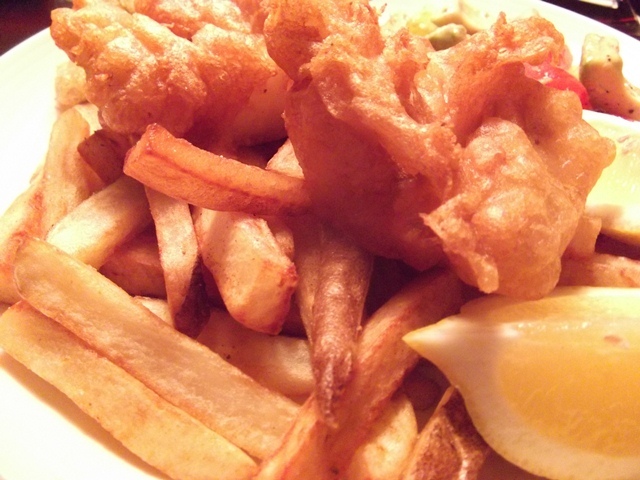 Malt vinegar and tartar sauce! So good. I’m surprised more people don’t stop by your place unannounced, hoping to catch you making something like this. OMG you’re killing me. FRIED PICKLES!? Dee-lish! After being down in the desert I believe I have found my ideal climate – hot and dry, with cool (to cold) evenings. AJ – you know it! Eileen – come by anytime! It’s a crapshoot though. Last night was soup from the freezer. 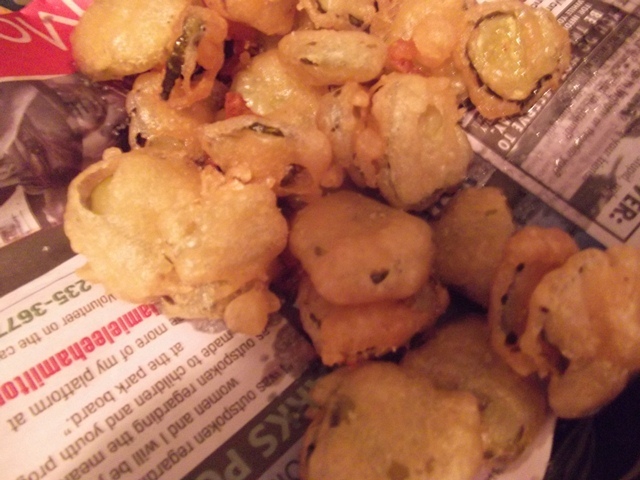 Vanessa – there is nothing that can’t be improved by deep-frying. Also hells yes to the desert!